The American short-story writer Lucia Berlin (1936-2004) is currently enjoying a bit of a renaissance. More than seventy of her stories were published during her lifetime, mostly in collections issued in the 1980s and ‘90s from small presses such as Turtle Island and Black Sparrow Press. 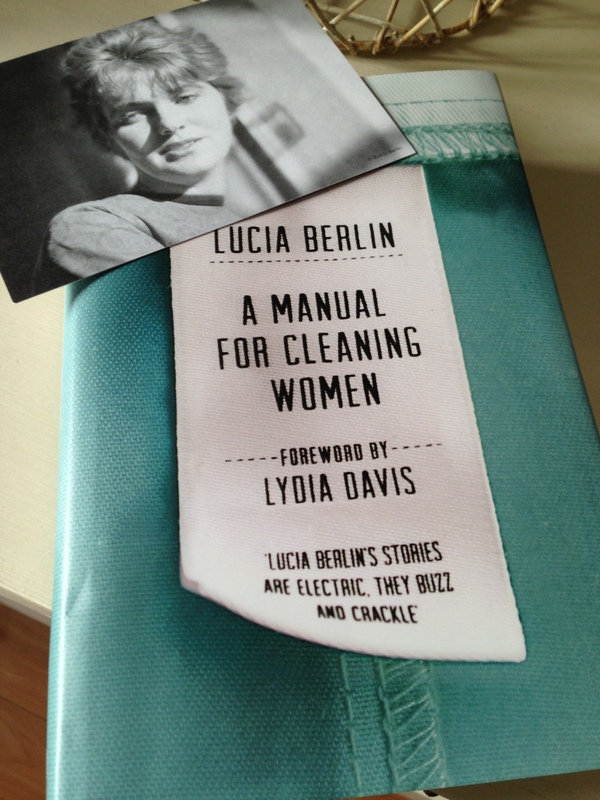 Now, more than a decade after her death, Berlin and her work are reaching a much wider audience courtesy of this collection of forty-three of her pieces, A Manual for Cleaning Women, brought to us by the team at Picador. This is a wonderful set of short stories, so raw and striking that I’m beginning to wonder whether I’ll read a better collection all year. Lucia Berlin seems to have lived many lives during her time, and her work draws heavily on various experiences from her lonely and unhappy childhood right through to her more settled old age. Before the war, Berlin’s father worked in the mining industry; consequently, the family moved around a fair bit, spending time in Idaho, Kentucky and Montana. When her husband went off to the war, Berlin’s mother took Lucia and her younger sister to live with their grandparents in El Paso – Mamie and Grandpa both feature in a number of the stories included here, as do other members of the Berlin family, most notably Lucia’s sister. I mention these events because they have a direct bearing on Berlin’s work. Her stories are little slices of life, vignettes drawn from her own remarkable experiences. With more than forty pieces in this collection, it’s going to be impossible for me to cover even half of these stories. My aim instead is to give you a flavour of the collection, primarily Berlin’s style and a few of her key themes. The Blums have a lot of pills, a plethora of pills. She has uppers, he has downers. Mr. Dr. Blum has belladonna pills. I don’t know what they do but I wish it was my name. Alongside these acute observations, the narrator reflects on her lost lover, Ter, a young cowboy from Nebraska. These passages are indicative of the deep sense of loss and loneliness that runs through several of Berlin’s stories. Once he told me he loved me because I was like San Pablo Avenue. Unsurprisingly, given the background I mentioned earlier, much of Berlin’s work features women trying dealing with the harsh realities of their fractured lives. We meet a bright but lonely young girl struggling to adjust to a new school; a mother so desperate for her next drink that she leaves her children unattended in bed while she goes in search of alcohol; a young addict experiencing her first detox in a hospital; there are many more, several are heartbreaking. Some of these stories are set in the places we’d rather not think about too often: prisons, backstreet abortion clinics, detox wards and emergency rooms. In Mijito, one of the most haunting pieces in this collection, a ward clerk/nurse describes how she copes with the suffering she encounters in her work. By now you’re probably thinking that this all sounds terribly grim. Yes, these stories explore pretty harrowing territory, but the flashes of wry humour in Berlin’s work help to balance the tone often providing some much-needed relief from the bleakness of the protagonist’s situation. In Angel’s Laundromat, the narrator, a woman living in Albuquerque, New Mexico, describes why she goes to Angel’s, a down-at-heel launderette frequented by old women, travelling people, teenage Chicana brides and Pueblo Indians. I loved the final lines in this passage. There are other moments of brightness, too: stories drawn from Berlin’s time with the men in her life, two of whom were jazz musicians; pieces featuring her cousin, the beautiful Bella Lynn; stories of her reconnection with Sally, the sister she nursed through the final stages of cancer. These pieces are compassionate, graceful and emotionally truthful; the writing is shot through with little insights about life. In Wait a Minute, the narrator is reflecting on what happens to time when a loved one dies. Time stops for the person who has passed away, but for those who are left behind it runs amok, disrupting the normal rhythms of their days and nights. There are some truly remarkable pieces in this collection, several of which reminded me of the work of Raymond Carver and Joan Didion. Sometimes when I read short stories, I can sense the author’s hand on the tiller, driving the narrative in a certain direction, engineering events and developments towards a pre-determined outcome. There is none of that sense of deliberate construction or artificiality here. Berlin’s stories are natural, free-flowing and fluid; they feel grounded in authenticity and truth. I’ll finish with one final quote, a passage that illustrates Berlin’s skill in capturing a strong sense of place in her writing. Her descriptions are thick with the sights, smells and sounds of her locations, making it easy for the reader to visualise these scenes in their mind. In this excerpt from Tiger Bites, the narrator is returning to Mexico, a place that hums with activity. For another perspective on this very impressive collection, click here for Gert Loveday’s review. A Manual for Cleaning Women is published by Picador – my thanks to the publishers for kindly providing a copy for review. This entry was posted in Berlin Lucia, Book Reviews and tagged Book Review, Fiction, Lucia Berlin, Picador, Short Stories, US on March 30, 2016 by JacquiWine.